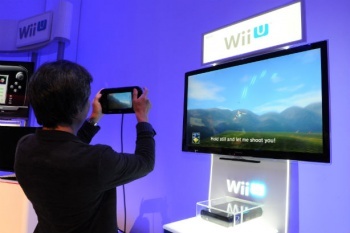 Star Fox Wii U will make usage of the Wii U's GamePad to offer two different perspectives on battle. While we unfortunately didn't hear anything about the new rumored Star Fox Wii U title during Nintendo's E3 Digital Event, a select group of journalists were actually given a glimpse of the title behind closed doors at a pre-E3 event, Joystiq reports. The title, which will release in 2015, was at a very early tech-demo stage, and makes usage of the Wii U's unique GamePad controller to provide two perspectives on battle. The project is being led by legendary Nintendo developer Shigeru Miyamoto himself. On the television screen, players see a zoomed out view of the Fox's Arwing. Steering is handled with the left analog stick, and tricks such as barrel rolls and u-turns are done with the right. Clicking in the stick will also transform the Arwing into the "Landmaster" tank form. Meanwhile, on the Wii U's gamepad, players will see a cockpit view with a targeting reticule. Physically moving the controller around in midair moves the reticule, letting you snipe enemies with precision never before seen in a Star Fox title. Additionally, the game will feature a new "Helicopter mode". The helicopter's elevation is controlled with the GamePad's right stick while steering's handled by the left and the GamePad screen lets you target at an angle below the helicopter. Miyamoto also said during a Q&A session that the game will feature a full story, but it will be broken into small chunks so players can complete the missions in any order. The game will also, of course, feature the traditional on-rails shooting stages of the franchise, which Miyamoto referred to as "Valley Mode" stages.